Last year, during Hurricane Sandy I rediscovered a craft that I had long forgotten, the craft of crocheting. It was a skill that was passed on to me as a child from my grandmother, who learned it from the women who came before her. 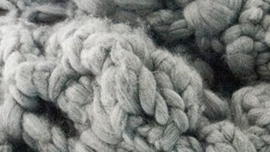 There is a creative calm that I find when I crochet and a comfort in knowing that by both blood and yarn, I am still connected to those women who have passed on before me.